Hello everyone! 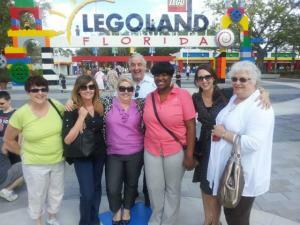 We wanted to drop by and tell you all about a recent group outing to one of Florida&apos;s newest attractions! LEGOLAND® Florida is a 150-acre interactive theme park dedicated to families with children between the ages of 2 and 12. With more than 50 rides, shows and attractions, LEGOLAND is geared towards family fun. Located in Winter Haven, FL and just 45 minutes from the Orlando theme parks and downtown Tampa. LEGOLAND is a brand of interactive theme parks dedicated to families with children between the ages of 2 and 12. Each Park features more than 50 rides, shows and attractions geared towards interactive family fun. There are four other LEGOLAND Parks in the world – LEGOLAND Billund in Denmark, LEGOLAND Windsor outside of London, LEGOLAND California in the U.S. and LEGOLAND Deutschland near Günzburg, Bavaria Germany. Legoland Florida provides education, adventure and in this second park of its kind in the United States. Kim Iseman, Director of Sales & Marketing and Todd Andrus, Sales Manager with Legoland gave us a in-depth tour of the park’s newest addition opening in late May. It is Legoland Water Park. It will be a waterpark for both children and adults to enjoy. There will be an additional $15 added to the admission price of the Theme Park to be able to enter this section of Legoland. People can stroll through the exhibits and hands on experiences of Legoland and walk to the water park to cool off and enjoy the rest of the afternoon. They will have cabanas to rent, beach chairs, restaurant on site, lockers all with the Legoland theme. Legoland is a fun place to spend the entire day. The activities are limitless and it is a place where children can have their imaginations soar. That&apos;s all for now folks, but stay tuned in for more updates on things to do in Tampa Bay!